Is it okay to have reverse electrical polarity running through the Brickstuff products? I'm only planning on using lights and branch boards, no controllers or effects. Hi Bryan, thanks for your message. It's ok to reverse polarity as long as you just have LEDs, however the LEDs themselves won't light with reverse polarity as they are diodes that only pass electricity in one direction. Have you thought about using magnetic connectors with one conductor in the center, so you always have correct polarity no matter the orientation? See the photo below for what we used several years ago in our experimental power connectors. 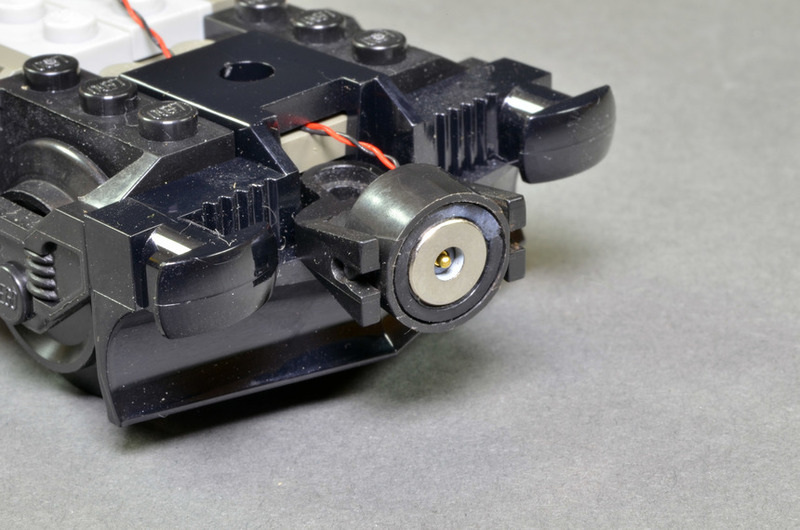 We don't sell these mounted inside LEGO couplers anymore, but we could sell you just the male + female magnetic connector pairs and you could solder your wires to the backside. Depending on the price that might be do-able. However from the picture it still looks like the magnet can't change orientation due to the wire coming out of the back. I would still be limited in which direction the modules could face, unless the magnet set up works differently than shown below. What I'm thinking of might not work without some rebuilding/rerouting of wires each time I want to flip the modules. Bryan Fraser Hi Bryan, I could sell you a pair of couplings for $5.95. We have a lot of them, so let me know if that would work and how many you'd like. I could take some better photos of just the connectors so you could see the solder tabs on the back if you'd like. The good thing about the magnet setup is that the two connectors are contained within the circle. One conductor is in the center (the gold pin in the photo above), and the other conductor is the outer silver ring. So it doesn't matter what orientation the connections happen-- all that matters is that one male connector pairs with a female, and they have pretty good clutch so they will attract each other and pretty much connect automatically. Rob Klingberg Hi Rob, If you have 8 pairs of connectors I could buy, I would be willing to play with them. Bryan Fraser LOL yeah, we've got hundreds. Let me put them up on the website in the DIY section-- then you can order as many as you'd like. I'll try to get them up today.